Wisconsin growers are increasingly interested in utilizing cover crops. While cover crop establishment is relatively easy following corn silage, small grains, and processing vegetables, establishing cover crops successfully following corn or soybean has been more difficult. Aerial seeding or over-the canopy seeding late in the growing season can be done with moderate success. 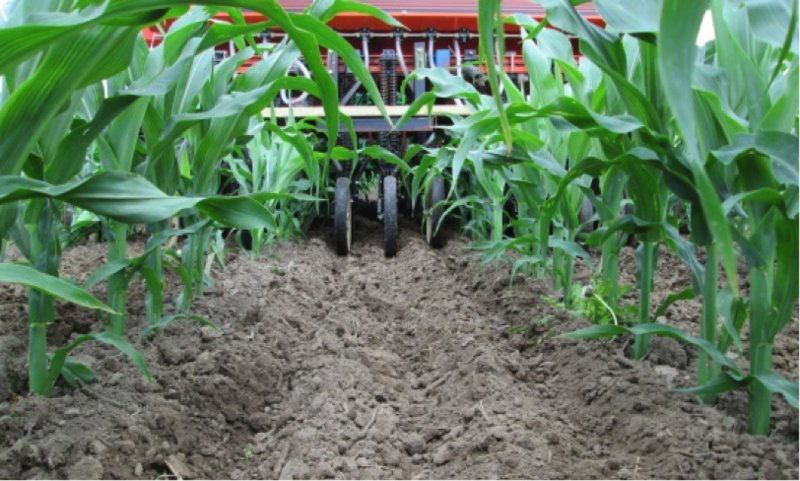 An alternative approach is to interseed cover crops into a standing corn crop early in the growing season. 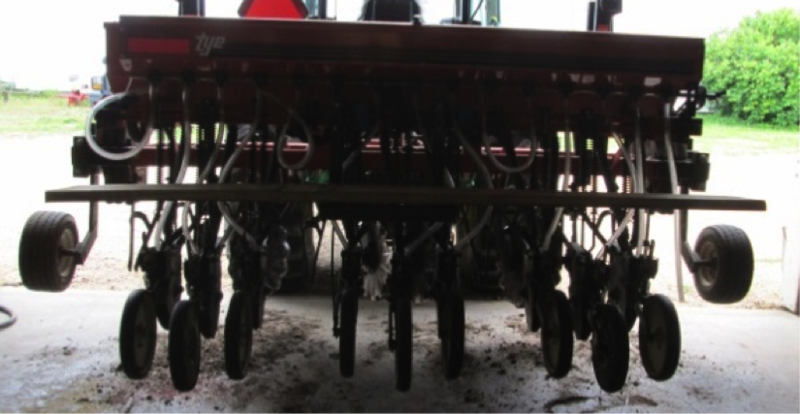 This management practice requires special or at least modified equipment, but can improve cover crop establishment by drilling seed rather than broadcast. Ideally, the cover crop will establish prior to canopy closure, but then survive to the end of the growing season without creating too much competition for resources (nutrients and water) for the corn crop. Little experimentation has occurred in Wisconsin to evaluate cover crop growth when interseeded into standing corn and the impact of interseeding cover crops on corn grain yield. A research study was conducted during the 2014 growing season at the Arlington Agricultural Research Station. The field was planted with soybean in 2013 and chisel plowed post-harvest. Corn was planted in early June. Five cover crops treatments were planted into corn: (1) radish, (2) red clover, (3) winter rye, (4) oat/pea mixture (70% oats, 30% pea), and (5) no cover crop. Table 1 shows seeding depth and rates. Cover crops were drill seeded when corn was at the V5 growth stage (July 14) using a modified no-till grain drill (Fig. 1). The drill had four row units removed, leaving 6 row units to allow the drill to go through the crop rows and plant three rows of cover crops between each corn row (Fig. 2). The no-till disks and supporting hardware were also removed to prevent damage to the corn. Table 1. Cover crop seeding rate and seed depth placement. Figure 1. Modified grain drill to allow seeding into corn. Figure 2. Interseeding (drilling) of cover crops on July 14, 2014. All cover crops were successfully established. Within four weeks of seeding all cover crops had germinated, had consistent growth during the growing season, and had good vigor up until two weeks of grain harvest. The corn never showed any visible symptoms of stress and the cover crops did not significantly reduce corn yields. Radish had the most above ground biomass at harvest. Radish and oat/pea all winterkilled. Red clover did not survive the winter. The red clover looked very poor at the time of corn harvest; the late corn harvest stressed the red clover too much for it to survive the winter. All cover crops were completely buried by the corn residue after harvest, but winter rye still survived the winter. Figure 3. Cover crop stands immediately prior to harvest with average corn yield (bu/ac) and average cover crop dry biomass weight (ton/ac). Table 2. Cover crop biomass prior to corn harvest and corn yield in plots where the cover crop was interseeded. This research trial is being replicated in 2015 to evaluate the effect of interseeded cover crops on corn yield across multiple growing seasons. If no yield losses occur, future research will focus on evaluating the soil conservation, soil carbon building, and potential N credits obtained with interseeding these cover crops.